A second-generation champion and one of the great drivers in history, taking wins in a variety of different cars, from go-karts to CART. 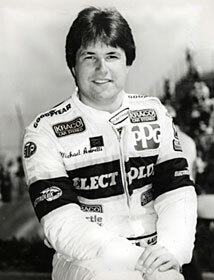 Michael Andretti was introduced to racing upon his birth in 1962, as the son of legendary racer Mario Andretti. It didn’t take long for the second generation to begin applying himself on the racetrack as well, with the youngster winning 50 go-kart races between 1972-79. Turning his career into a more mature form, Andretti turned pro in 1980, running in the Formula Ford Series. By 1981, Andretti captured his first of many wins and snared top honors in the Northeast division of the Formula Ford series with six victories. By 1983, Andretti graduated to Champ Cars, racing for Kraco. His conversion was quick, finishing seventh overall in his full rookie campaign, 1984. Andretti then went on to a highly successful run in CART racing. After several years of dominance in CART, Andretti switched over to European Formula One racing in 1993, scoring several impressive finishes during the season. He returned to American Champ racing in 1994, and has been a fixture in the top 10 virtually every year since. In all, his 40 overall wins trail only his father, Mario, and the legendary A.J. Foyt. Michael Andretti and his wife, Leslie, reside in Nazareth, Pennsylvania, with their children Marco, Marissa and Lucca. He was elected to the National Italian American Sports Hall of Fame in 2002.